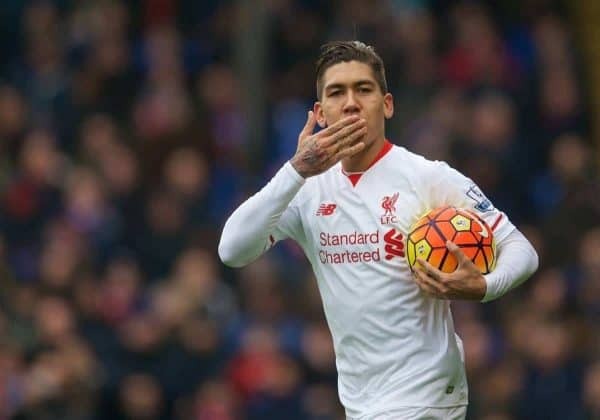 The form Roberto Firmino has enjoyed throughout 2016 so far is similar to that of former Liverpool striker Luis Suarez at the same age in 2010/11. Jurgen Klopp‘s arrival as Liverpool manager has seen Firmino strike a rich vein of form, coinciding with a move into his natural, central role in the Reds’ forward line. Since Klopp’s appointment at the beginning of October, the Brazilian has scored nine goals and registered nine assists. Remarkably, eight of Firmino’s goals have come since the turn of the year, with the former Hoffenheim man becoming a key player within Klopp’s attack. After a slow start under Brendan Rodgers, Firmino looks likely to seal Liverpool’s Player of the Year award at the end of the season, and his £29 million fee now represents something of a bargain. Such is the 24-year-old’s form in 2016, Firmino has proved comparable to Liverpool icon Suarez, in his first half-season with the club in 2011. Statistics, via Twitter user @natefc, show Firmino to be more productive this year in terms of goals, assists and key passes per 90 minutes than Suarez in his first six months on Merseyside. This is particularly impressive given Firmino has already played more minutes this year (1,294) than Suarez (1,102) in 2010/11. One area that Firmino will need to improve on if he is to emulate Suarez, however, is his shooting accuracy, with the Uruguayan testing the keeper considerably more often per 90. But having already showed signs of progress following Klopp’s arrival, and possessing a similar work rate to Suarez, Firmino looks set for a bright future at Liverpool. If Firmino can even come close to Suarez’s 31-goal season at the age of 27 in 2013/14, Liverpool will have a sensational player in their midst; the early signs are positive.